The Parish and Ward Church of St Botolph-without-Bishopsgate is where John Keats was baptised. 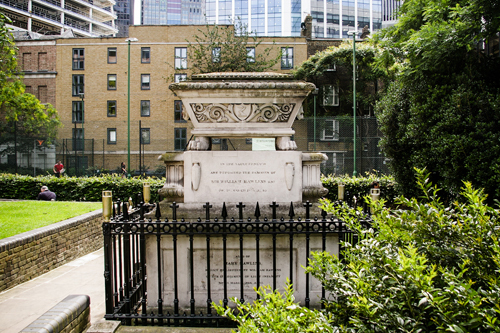 Keats was born on 31 October 1795 – we assume at the Swan and Hoop Livery Stables, Moorgate, which his parents managed. We know for sure, however, that he was baptised at St Botolph’s, Bishopsgate, a little further east of the stables along the line of the old London Wall, on 18 December 1795. Wonderfully, the very font he was baptised in is still in use at the church! Keats’ sister Frances Mary (known as Fanny) was also baptised at St Botolph’s, on 17 June 1803. 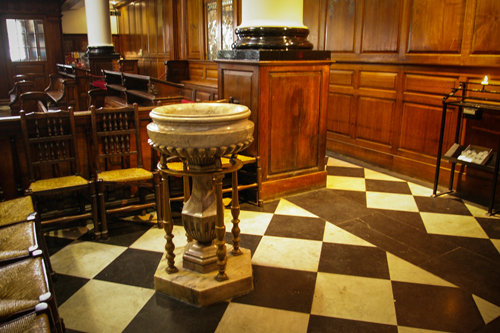 The font in which John Keats and his sister Fanny were baptised. There has been a church on this site since Saxon times, with a suggestion that Christian worship here dates back to the Romans. The current church was built in 1725-29, designed by James Gold (or Gould) under the supervision of George Dance. It remains much as the Keats family would have known it, except for the addition in 1820 of the ceiling lantern, to let in extra light. As is usual with these old churches, it is rich with resonant names from history! An infant son of Ben Jonson’s was buried in the churchyard, and Edward Alleyn was baptised here in 1566. Emilia Bassano Lanier, thought by some to be Shakespeare’s “Dark Lady”, was baptised at the church in 1569, and married here in 1592. Mary Wollstonecraft, author of A Vindication of the Rights of Women and mother of Mary Shelley, was baptised here on 20 May 1759. The church escaped any significant damage during World War II, but was badly hurt by an IRA bomb in 1993. Restoration took several years. 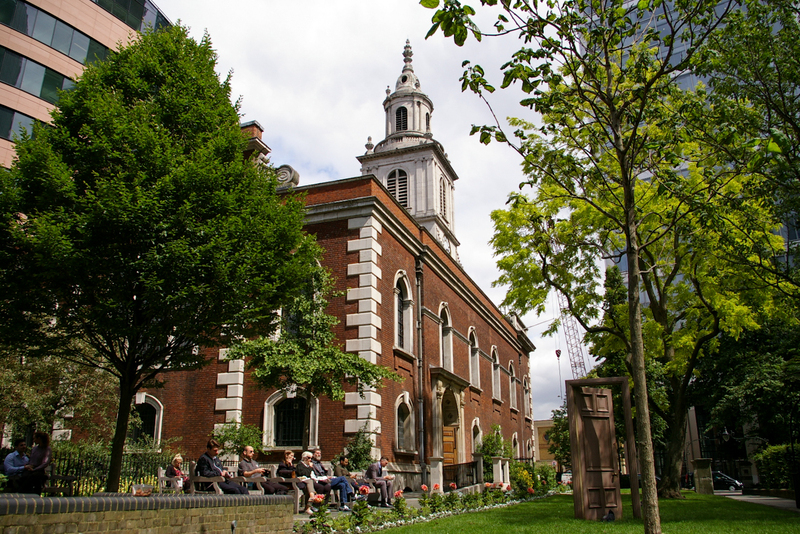 The churchyard was the first of the City’s burial grounds to be converted into a public garden, so it is a lovely green oasis now, and very pleasant to visit. There is also a netball and tennis court available for use. 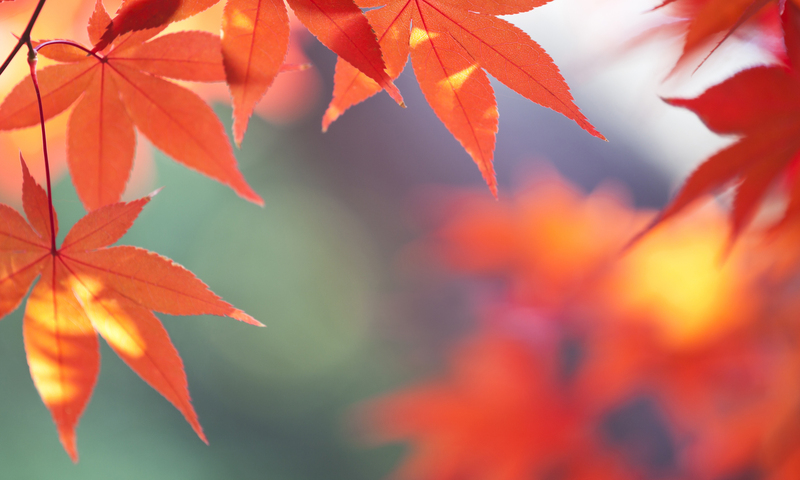 When I was there on a sunny afternoon, it was nice to feel the place abuzz with life. The tomb of another William Rawlings. There is a large tomb still in place on the grounds, of Sir William Rawlings, a sheriff and a benefactor of the church. This is rather disconcerting to stumble upon unawares, William Rawlings also being the name of Keats’ erstwhile stepfather (the second husband of his mother Frances)! I would certainly recommend a visit. It’s a lovely place, and being able to pay your respects to The Actual Font is just magic!